From 1964, after some success in motor-racing, namely with the Porsche 550 Spyder, the company launched the Porsche 911 another air-cooled, rear-engined sports car, this time with a six-cylinder "boxer" engine. After that we have seen the 911 in refined and more refined design and improved performance till now .The future avatar of 911 Carrera 4S will definitely shocked you . With the Carrera 4 and Carrera 4S, Porsche rolls out the first four-wheel-drive versions of its new, seventh-generation 911. 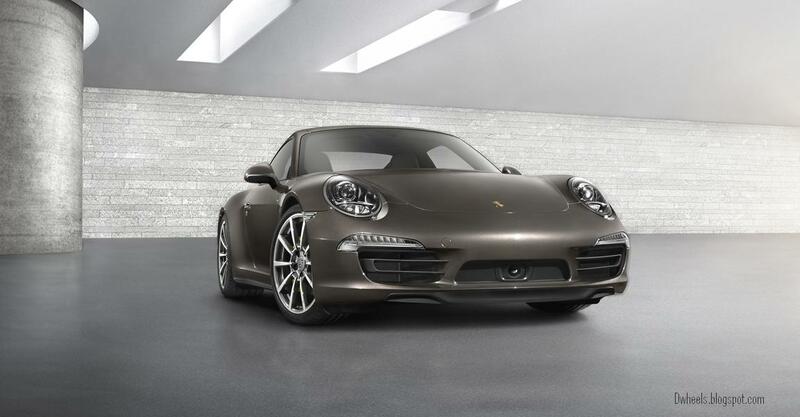 Porsche claims theprevious version of the Carrera 4 accounted for 34 percent of 911 sales worldwide. Replacing last year’s 997-based models, the new Carrera 4 and 4S coupes will go on sale early 2013, with the cabrio iterations of both due in spring. Compared with the rear-drive Carrera, the rear fenders of the 4 and 4S each flare an extra 0.9 inch, and a 1.4-inch-wider or 1.7-inch-wider rear track (Carrera 4S, respectively) and slightly wider tires lurk under those zaftig hindquarters. The 911 Carrera 4S models are powered by a 3.8-liter boxer engine with direct fuel injection (DFI) and VarioCam Plus. It produces 400 horsepower at 7,400 rpm and the maximum torque of 325 lb.-ft. is achieved at 5,600 rpm. It goes 0-100 Kmph in 4.3 sec . The top track speed is 185 mph. With optional Porsche Doppelkupplung (PDK), the 911 Carrera S accelerates from 0 to 60 mph in 3.9 seconds and achieves a top speed of 187mph. The new Carrera 4S completes the 0 to 60 mph sprint in 4.0 seconds and boasts a top speed of 185 mph. A widely held belief about motorsport is that power is the only thing that matters. From experience, we know better. Extra horsepower alone has never been enough to win a single race. Much more important to us are ideas – ideas that inspire more intelligent vehicle concepts and more efficient drive systems. The same applies on the road. It’s about getting the most out of what you’ve got. The Auto Start/Stop function is standard in the 911 Carrera models. In cars with the manual gearbox, the engine switches off automatically when, for example, you stop at traffic lights, select neutral and release the clutch pedal. 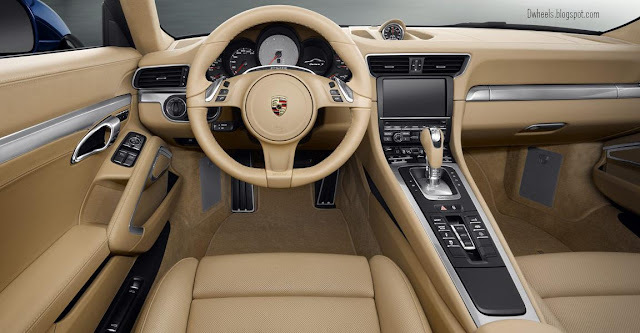 In cars with Porsche Doppelkupplung (PDK), the engine switches off whenever you stop and leave your foot on the brake pedal. The ‘coasting’ function available with Porsche Doppelkupplung (PDK) enables you to save even more fuel where the situation allows. The engine is decoupled from the transmission to prevent deceleration caused by engine braking. In this way, optimum use is made of the vehicle’s momentum, allowing it to coast for longer distances. For example, you may want to slow down from 65 to 40 mph in anticipation of the change of speed limit ahead. As soon as you release the accelerator pedal, PDK deselects the current gear automatically and you begin to coast in neutral until you have reached your desired speed. The moment you engage the accelerator or brake pedal, PDK selects the appropriate gear smoothly and seamlessly within a fraction of a second. Another way to reduce fuel consumption is to utilize the coasting function on downhill gradients that are gentle enough for you to maintain a constant speed. Efficient on long journeys, such as on the motorway, PDK remains ready to respond as swiftly and precisely as you would expect. Pure, direct, precise. Short shift movements and an optimum transition from one gear to the next. That’s exactly what you would expect of a Porsche manual transmission. What you might not have expected is a 7-speed manual transmission that combines a high level of sporty performance with an equally high level of efficiency and offers extra comfort for longer journeys. It’s an exceptional innovation, and not only in the sports car segment. The design of this manual transmission is based in principle on that of Porsche Doppelkupplung (PDK). Gears 1 to 6 have a sports ratio and top speed is reached in 6th gear. The additional 7th gear, however, has a long ratio, which reduces torque and helps to reduce fuel consumption. Lower engine revs at fast driving speeds also ensure a high level of comfort on long stretches of road. In addition, a gear indicator in the rev counter reminds you which gear has been selected. The upshift indicator in the instrument cluster helps you actively conserve fuel. Thanks to the elevated center console, the gear lever is within easy reach – ideal for sporty gear changes. In total, PDK has seven gears at its disposal. Gears 1 to 6 have a sports ratio and top speed is reached in 6th gear. 7th gear has a long ratio and helps to reduce fuel consumption by keeping engine revs low. PDK is essentially two gearboxes in one and thus requires two clutches. This double-clutch arrangement provides an alternating, non-positive connection between the two half gearboxes and the engine by means of two separate input shafts. The flow of power from the engine is transmitted through one half gearbox and one clutch at a time, while the next gear is preselected in the second half gearbox. During a gear change, therefore, one clutch simply opens and the other closes at the same time, enabling gear changes to take place within milliseconds. The effect is instant. Driving feels even sportier and more dynamic, and agility is increased. Depending on the gearshift program (SPORT button activated or deactivated), the gear change is optimized for comfort or for sporty driving. With the optional Sport Chrono Package, PDK is enhanced by the ‘Launch Control’ and ‘motorsport-derived gearshift strategy’ functions. It is possible to have a lot of power and yet not be able to move anything. Only by using your power intelligently will you truly progress – and with consummate ease. Enhanced Porsche Traction Management (PTM) is standard on all 911 Carrera all-wheel-drive models. It is an active all-wheel-drive system with an electronically variable map-controlled multi-plate clutch, automatic brake differential (ABD) and anti-slip regulation (ASR). Drive power is distributed between the permanently driven rear axle and the front axle by means of the electronically variable multi-plate clutch. The status of the vehicle is continuously monitored so that it is possible to respond to different driving situations. Sensors are used to collect a range of data, including the rotational speed of all four wheels, the lateral and longitudinal acceleration of the car and the current steering angle. If, for example, the rear wheels begin to lose traction under acceleration, a greater proportion of the drive power is automatically transmitted to the front axle by a more positive engagement of the multi-plate clutch. In addition, ASR prevents wheel spin by adapting the engine’s power output. During cornering, the optimal level of drive power is distributed to the front wheels to ensure excellent lateral stability. In conjunction with Porsche Stability Management (PSM), PTM helps to ensure the perfect distribution of drive power for optimum traction in most road scenarios, whether on long straights, through tight corners, or on surfaces with different friction coefficients. 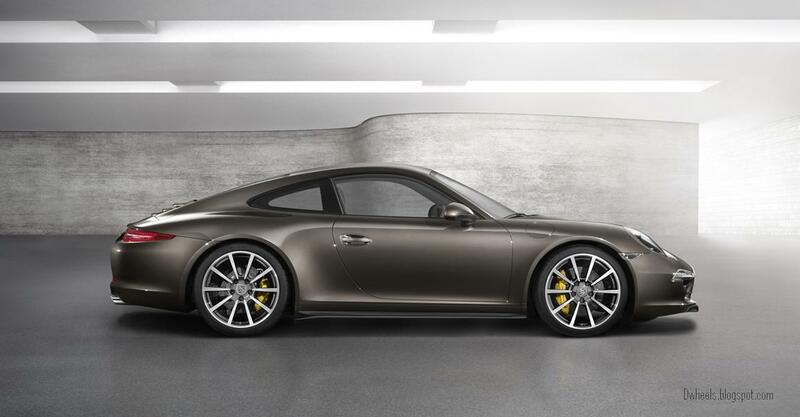 The exhaust system of the 911 Carrera models has been redesigned, acoustics included. The stainless-steel exhaust system comprises two distinctive and independent exhaust tracts. The catalytic converters heat up rapidly for effective emissions reduction. A selectable twin-tube sports exhaust system featuring distinctive polished stainless-steel tailpipes is available as an option. Activated by a button, it produces an even more intensive sports car sound. The cross-drilled PCCB ceramic brake discs for the 911 Carrera have a diameter of 13.8 inches (350 mm) front and rear for even more formidable braking performance. The use of six-piston aluminum monobloc brake calipers on the front axle and four-piston units at the rear – all finished in yellow – ensures extremely high brake forces which, crucially, are exceptionally consistent. PCCB enables shorter braking distances in even the toughest road and race conditions. Excellent fade resistance ensures greater balance when slowing from racetrack speeds. The key advantage of PCCB is the extremely low weight of the ceramic brake discs, which are approximately 50% lighter than standard discs of similar design and size. As well as enhancing performance and fuel economy, this represents a major reduction in unsprung and rotating masses. The consequence of this is better road holding and increased comfort, particularly on uneven roads, as well as greater agility and improved handling. Please note that circuit racing, track day use and other forms of performance driving can significantly reduce the service life of even the most durable brake pads and discs. As with conventional high-performance braking systems, we recommend that all brake components be professionally inspected and replaced where necessary after every track event. The innovative bodyshell of the 911 fulfills two structural design requirements: first, excellent driving dynamics due to the body’s extremely high rigidity; second, a vehicle weight saving of up to 143 lbs primarily as a result of the intelligent lightweight construction. To meet the second requirement, we employed state-of-the-art techniques for combining various materials in order to utilize specific material properties exactly where they are needed. For the bodyshell, therefore, we used very thin, but nevertheless extremely rigid, sheets of steel. Aluminum and magnesium were used extensively in areas such as the roof, underbody, front end, doors, rear wings and engine compartment and luggage compartment lids. Magnesium, which is a particularly lightweight material, was also selected for the cockpit and center console support beam and, in the Cabriolet models, the hood shell elements. Such material efficiency is key to reducing the overall weight and, as a result, fuel consumption of the vehicle. For the driver, this intelligent blend of materials reduces the weight of the vehicle and offers a high level of comfort thanks to excellent vibration-damping characteristics and particularly high composite rigidity, an increase in dynamic torsional stiffness of up to 25% compared with that of the previous model, and even sportier handling despite a further improvement in the weight to power ratio. The longer wheelbase improves comfort as well as straight-line accuracy and driving stability at high speeds and in fast corners.